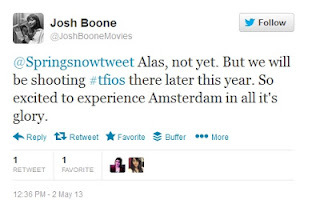 Director Josh Boone has confirmed via Twitter that some of The Fault in Our Stars movie scenes will be shot in Amsterdam. If you have read the book, you have already known that one of the pivotal moments was Tris and Gus' trip to Amsterdam to see their favorite author Peter Van Houten. He also said that TFiOS will be shot later this year. As of the moment, the confirmed cast is Shailene Woodley, she will play the lead Hazel Grace. As for Gus, there were five actors in the mix for the role and this does not mean that one of them will get it. You can read the post here.